Bosworth, C. E. (1989). "Barda and Barda-Dāri v. Military Slavery in Islamic Iran". In Yarshater, Ehsan. Encyclopædia Iranica. III: Ātaš - Beyhaqi. London, UK: Routledge & Kegan Paul. pp. 774–776. ISBN 0-7100-9090-0. LCCN 84673402. Archived from the original on 24 May 2015. Retrieved 24 May 2015. Cole, Juan R. I. (May 1987). "Rival Empires of Trade and Imami Shi'ism in Eastern Arabia, 1300–1800". International Journal of Middle East Studies. Cambridge, UK: Cambridge University Press. 19 (2): 177–203. doi:10.1017/s0020743800031834. ISSN 0020-7438. (Subscription required (help)). Haneda, Masahi (1990). 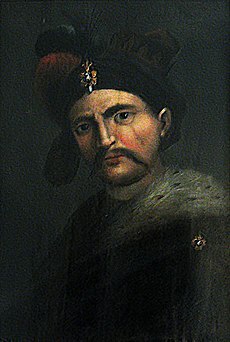 "Čarkas: ii. Under the Safavids". In Yarshater, Ehsan. Encyclopædia Iranica. IV: Bāyjū - Carpets. London, UK: Routledge & Kegan Paul. pp. 818–819. Archived from the original on 13 September 2014. Retrieved 13 September 2014. Kouymjian, Dickran (2004). 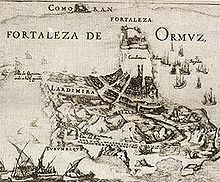 "1: Armenia From the Fall of the Cilician Kingdom (1375) to the Forced Emigration under Shah Abbas (1604)". In Hovannisian, Richard G. The Armenian People from Ancient to Modern Times. II: Foreign Dominion to Statehood: The Fifteenth Century to the Twentieth Century. New York, NY: St. Martin's Press. ISBN 1-4039-6422-X. LCCN 2004273378. Lockhart, Lawrence (1953). Arberry, Arthur John, ed. The Legacy of Persia. The Legacy Series. Oxford, UK: Clarendon Press. LCCN 53002314. Madelung, W. (1988). "Baduspanids". In Yarshater, Ehsan. Encyclopædia Iranica. III: Ātaš - Bayhaqī. London, UK: Routledge & Kegan Paul. pp. 385–391. ISBN 0-7100-9121-4. LCCN 84673402. Archived from the original on 13 September 2014. Retrieved 13 September 2014. Matthee, Rudi (1999). "Farhād Khan Qaramānlū, Rokn-al-Saltana". In Yarshater, Ehsan. Encyclopædia Iranica. IX: Ethé - Fish. London, UK: Routledge & Kegan Paul. ISBN 0-7100-9090-0. LCCN 84673402. Archived from the original on 24 May 2015. Retrieved 24 May 2015. Parizi, Mohammad-Ebrahim Bastani (2000). "Ganj-ʿAlī Khan". In Yarshater, Ehsan. Encyclopædia Iranica. X: Fisheries - Gindaros. London, UK: Routledge & Kegan Paul. pp. 284–285. ISBN 0-7100-9090-0. LCCN 84673402. Archived from the original on 24 May 2015. Retrieved 24 May 2015. Roemer, H. R. (1986). "5: The Safavid Period". In Jackson, Peter; Lockhart, Lawrence. 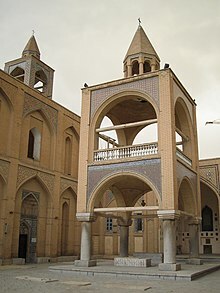 The Cambridge History of Iran. 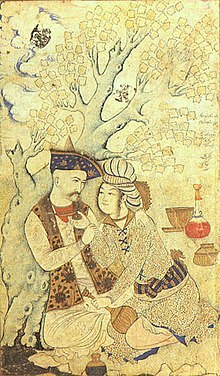 6: The Timurid and Safavid Periods. Cambridge, UK: Cambridge University Press. ISBN 0-5212-0094-6. LCCN 67012845. Savory, Roger M. (1983). "'Abbās (I)". In Yarshater, Ehsan. Encyclopædia Iranica. I: Āb - Anāhid. London, UK: Routledge & Kegan Paul. pp. 71–75. ISBN 0-7100-9090-0. LCCN 84673402. Archived from the original on 24 May 2015. Retrieved 24 May 2015. Shakespeare, William (1863). Clark, William George; Wright, William Aldis, eds. The Works of William Shakespeare. III. Cambridge, UK: Macmillan and Company. LCCN 20000243. Archived from the original on 24 May 2015. Retrieved 24 May 2015. Starkey, Paul (2010). "Tawfīq Yūsuf Awwād (1911–1989)". In Allen, Roger. Essays in Arabic Literary Biography. 3: 1850-1950. Wiesbaden, Germany: Otto Harrassowitz. ISBN 978-3-447-06141-4. ISSN 0938-9024. LCCN 2010359879. This page was last edited on 4 April 2019, at 20:05 (UTC).